Sushi is rice cakes topped with raw fish and delicacies. Japanese horseradish (wasabi), is usually put between the rice cakes and fish or other delicacies. Rice vinegar is usually poured onto the sushi. Besides rice cakes, sushi comes in a variety of forms, including rice rolls or cubes. 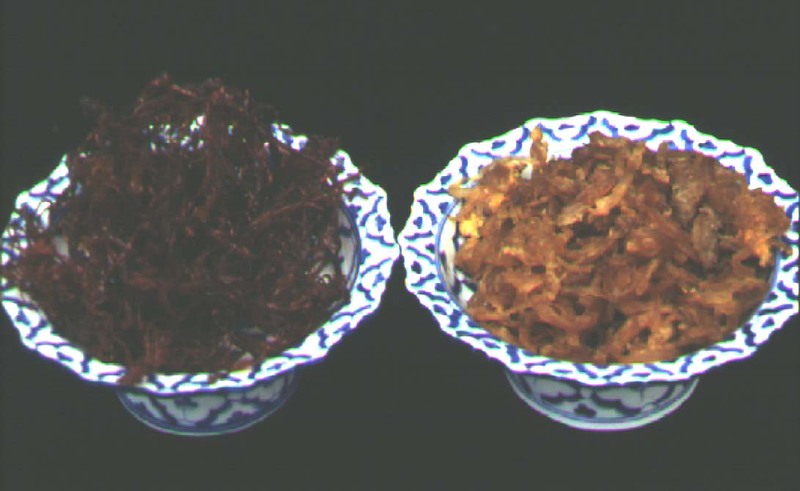 Raw fish, such as tuna, bonito, shrimp, squid and shellfish, and fresh eggs are often used. Sometimes vegetables, such as cucumber and seasoning gourd, are put in the middle of rolls wrapped with seaweed (nori). Sushi is usually dipped in soy sauce (shoyu). Rice vinegar, Japanese horseradish, and soy sauce are believed to inhibit microorganisms. The Japanese think that sushi is one of the most tasty and healthy of all their foods. They also think it is one of the most refined dishes because it requires great care to select only fresh materials. When the summer heat is scorching hot in Thailand, people look to a sumptuous flower-scented rice dish called khao chae for cooling off. Curiously, its origins are not related to the heat, but rather go back centuries to when the Mon people occupied the Central Plains. As part of their celebrations to mark the first day in their lunar calendar, the Mon offered gifts of what they called khao Songkran (Songkran rice) to the female guardian spirit of the New Year. 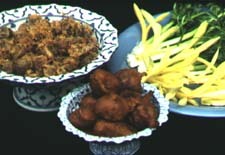 The name was later modified to khao chae because a special variety of rice is soaked (chae) in water. King Rama V, who reigned from 1868-1910, was extremely fond of khao chae, maybe because he found this refreshing rice dish a good way to cool off. The popularity of this elaborately prepared cuisine continues to endure. It is quite a dish to prepare. 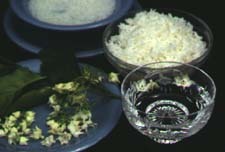 Ordinary jasmine rice is too soft, so the firmer khao taa haeng variety is used. It is first cooked in the normal way and then put in a colander and rinsed under running water several times to remove the excess starch. Then comes the unique ingredient: flower-scented water. A large pot is half-filled with water and a handful or two of fresh jasmine blossoms added. Then a small flower-scented candle is floated on top of the water, lit, and the pot covered loosely with the lid for 15 minutes. More blossoms and a candle with a different scent are then added and left for another 15 minutes—and then done for a third time. The scent from the candles and the natural oils from the jasmine should permeate the water. Sprinkle the rice liberally with scented water, then put into a piece of cheesecloth, twist the ends together to make a tight bundle and tie a knot in the top to stop the rice from swelling. Steam over boiling water. To serve, transfer some of the rice into a bowl, cover with more of the fragrant water and add a few small ice cubes and some of the flowers.